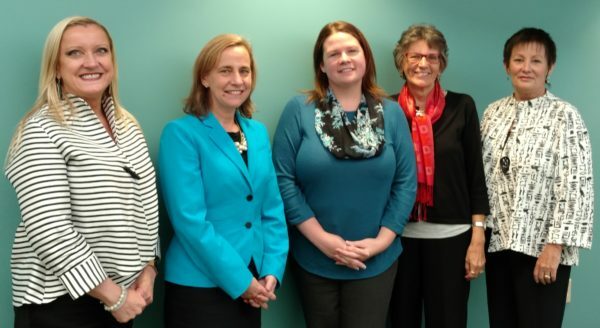 Jaime Hoebeke of the Manchester Health Department has been named the recipient of the 2018 Sandi Van Scoyoc Legacy Award by the New Hampshire Children’s Health Foundation. Hoebeke is head of the department’s Neighborhood Health Division. The Legacy Award’s annual prize of $2500 is presented to a New Hampshire organization or individual who exemplifies the foundation’s founding president’s commitment to improving the health and wellness of New Hampshire’s children and families. Hoebeke is well respected for championing efforts related to the city’s health improvement strategy, such as the Manchester Community Schools Project which aims to transforms local elementary schools into neighborhood hubs for residents. As part of this effort, bilingual community health workers and social workers have been co-located within targeted elementary schools in disadvantaged Manchester neighborhoods, in partnership with the Manchester Community Health Center. On average this connects 400 families to health, medical and educational resources each year. She also has worked to better identify integration opportunities to improve family connections to critical resources, such as within Manchester’s well established oral health program and mobile dental clinic. This past year more than 600 students received services and treatment through the city’s efforts. Gail Garceau presented the award to Hoebeke at a ceremony attended by Manchester Mayor Joyce Craig. Other initiatives Hoebeke has spearheaded include the introduction of the evidence-based model known as “Playworks” as a structured school recess program administered by City Year NH corps members which reduces bullying and playground injuries, “Parent Universities” in partnership with local non-profits, in which parent education is paired with a healthy family dinner or family breakfast, and linkages with food programs for students and their families.